UPDATE: Idaho State Police dispatchers say one lane of Highway 55 is open this morning. Traffic is being led by a pilot car. The fire is now estimated to be at least 1000 acres and it is still growing. 2,700 people are out of power this morning due to the fires. Crews are on site doing repairs, but the time is unknown as to when power will be back. 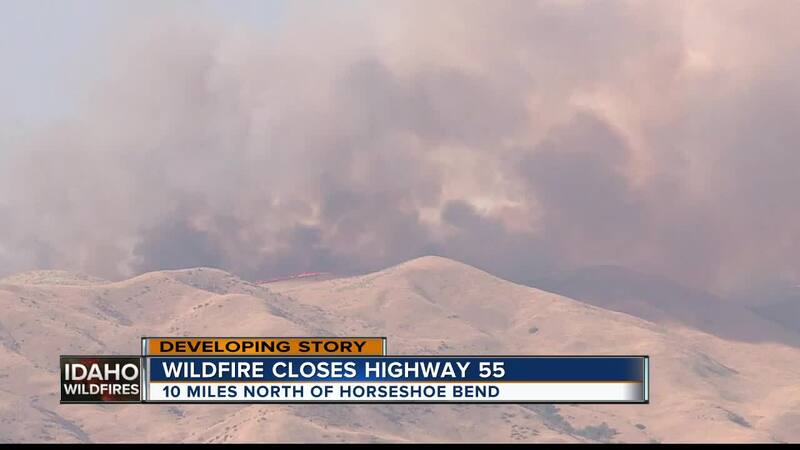 ORIGINAL STORY: Highway 55 has been closed in both directions from milepost 71 to 75 -– about 10 miles north of Horseshoe Bend -– as crews battle a wildfire in the area. The fire is about 700 acres and growing, according to Idaho Department of Lands. Crews from the Department of Lands, U.S. Forest Service, Garden Valley, and the Horseshoe Bend Fire Department are battling the flame. Early information has led investigators to say it's human-caused. While the exact cause is not confirmed, a Facebook update by Boise County Emergency Management says it may have been started by a blown tire with sparks from the rim.